“Breaking Bad,” “Mad Men,” “House of Cards,” “Transparent”—those and other upscale shows have smartened up television and fattened corporate earnings along the way. Better technology, not just creativity, is at work here. Is there a lesson for Kindle executives and others in the ebook industry, if they want to expand the market for literary fiction, which demands more of readers than does the typical e-potboiler? Definitely. Better tech means greater appreciation of better content, and the reverse applies as well. The sparse typographical options and other limitations of Amazon apps and hardware, even the $290 Oasis, must be taking at least somewhat of a toll on ebook sales of all kinds, but especially on literary fiction. Amazon even deprives Kindle users of the ability to read in all-text bold—seemingly trivial, but not to older people with contrast-sensitivity issues. Kobo’s new $230 Aura One offers some hope with a 7.8-inch screen and an extensive range of typographical choices, even letting you control the levels of text bolding. But for now, at least here in the United States, the Kindle line is the Kong of the market and is dragging down the entire U.S. industry by not displaying ebooks as optimally for individual book-lovers as they deserve. Forget about the 300 dots per inch resolution of most Amazon’s E Ink current ereaders. As I’ll show, Amazon must offer plenty else if it truly cares about good books. The more demanding the material, the more important it is to help readers enjoy books with as little effort as possible. Hollywood and streaming video companies, including, yes, Amazon Video, understand this far better than does Amazon in regard to the Kindle. Granted, improved technology is not in itself a panacea as a way to encourage people to read more books and better books. Even more crucially, we also need to promote the reading culture, one reason why I’m so keen on a national digital library endowment (here, here, here and here) that among other things could help pay for the hiring and digital-era professional development of librarians, especially school librarians. Besides, not all reading needs to happen on the fanciest hardware. Cell phones let you squeeze in reading if you’re in a long grocery line or on the bus, and in fact, given that the phones are always with us, I’ve even suggested the creation of cell phone book clubs. Furthermore, some people may actually read better off small screens. Others, though, may fare much better with larger screens, both in terms of reading faster and in terms of more thoroughly absorbing complex books. Naomi Baron, a prominent critic of ebooks in their present form, calls attention to the screen-size issue in Words Onscreen: The Fate of Reading in a Digital World. Furthermore, while phones and tablets are alternatives, E Ink devices like the Kindle are special because so many people find them more comfortable to read from. No LCD glares at you when you’re reading from a Kindle. Nor are there interruptions from Facebook and other social media or as great a risk of sleep disruption from the usual backlighting. If nothing else, owners of dedicated E Ink devices tend to buy more books than do other readers. And I do see some cause-effect, not just correlation: reading is less of a chore. You’d think, then, that Amazon would follow Kobo’s example and give Kindle readers more options in areas such as typography. No such luck so far. Amazon has been deaf to pleas for more reader choice. From a prominent librarian to obscure booklovers, people have written jeff@bezos and complained to his tech support people in vain. Still, I’ll go on to make a case for Amazon to learn from the TV side if it really cares about books. “Breaking Bad” and other stellar programs have been astoundingly novelistic with fully developed plots and characters. Even as brilliant a creator as Woody Allen, not Philip Roth but the quintessential writer for many New Yorker fans, is coming out with an Amazon series. Better writing, acting and directing could partly explain the trend—a bonus from the dumbing down of theatrical movies to play up cartoonish action fare for global audiences. Spurned, many of the most gifted writers, actors and directors have gone on to focus on Netfix and the Amazon in addition to cable. Does this mean that every program outside broadcast TV is Playhouse 90 in quality? Of course not. Dreck abounds. But we also see a burst of niche programming for discerning viewers around the world. Just the same, the writing is not the only reason why characters in series like “Breaking Bad” come across as believable despite such freakish anomalies as a high school chemistry teacher becoming a meth king. Technology also counts. Checked out TVs lately? They have come a long way from the days when you could fiddle only with contrast, brightness, color and other classic choices. Nowadays TV buyers enjoy a multitude of new adjustments such as for “preferred color” (for skin, grass and sky). Other innovations have popped up. Two big buzzwords in the TV business these days are Ultra High Definition and HDR. In the current incarnation on sale at Amazon and your local big box store, UHD (aka 4K) gives TV four times the pixel count of the standard 1920×1080 sets. You can sit closer to your screen and enjoy a more immersive experience compared to standard High Definition TV. No longer is the distraction as great from the individual dots. For a reasonable $447 on Amazon as of this writing, you can buy LG’s 43UH6100 43-Inch 4K Ultra HD Smart LED TV, which includes the basic HDR capabilities that can make a real difference on Netflix or Amazon Video when you use the built-in smart apps for those services. By contrast, Amazon is charging an outrageous $290 for the Oasis—just short of two-thirds of the discounted cost of the 43UH6100—and still offering just a limited range of typographical choices. What’s more, it is omitting a convenient text to speech interface for sighted users who are able to use this so-far-undocumented Oasis feature. The word “choice” is key. TV makers understand that advanced technology does not just mean more pixel per inch, greater contrast, or more colors. It also means giving users control of their experiences, which in turn will increase the level of engagement not only with their devices but also with the television and with the particular programs they are watching. All these choices makes TV sets more competitive than they would be otherwise with, say, tablets and phones, so people are less likely to abandon traditional sets as a viewing platform. By contrast, by limiting reader choices in such areas as typography and text to speech, Amazon is reducing the attractiveness of reading compared to other media. Amazon, I suspect, would respond that its designers have settled on just the right mix of features and options for its typical customers. Of course, the word “typical” could be Amazon’s undoing. Just as with office furniture, eyeglasses, or hearing aids, the range of possibilities is endless. The right desk for a 6’9″ basketball player is not the same as for a 4’9″ schoolteacher. My own pet peeve is lack of an all-text bold option—my brain must work harder to process what I’m reading. Before I can even go on to making sense of the words and paragraphs and chapters in the book, the letters must be legible to me. This matters with books of all kinds, but especially with literary fiction, which demands more of readers. Take a good look at the photograph above. 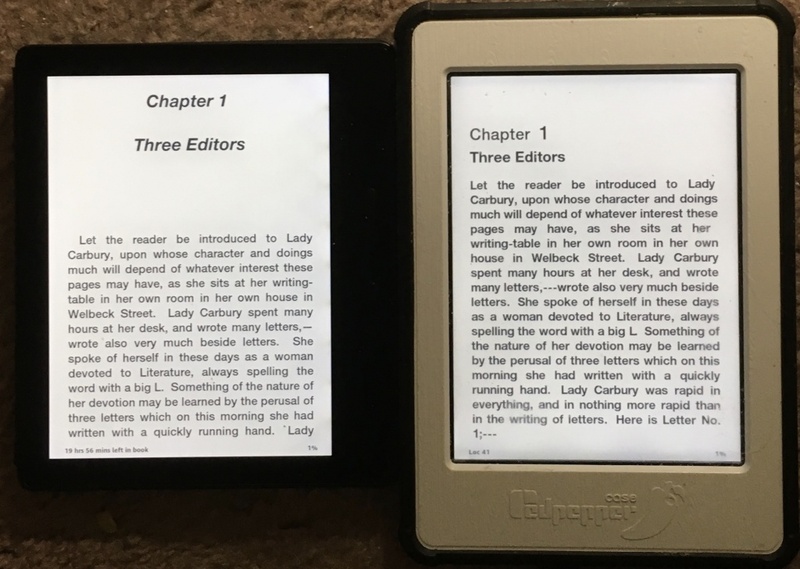 By way of a pre-bolded file, the $120 Paperwhite on the right is displaying darker text than the deluxe Oasis on the left and is far more readable for people with contrast sensitivity issues. I’m in my sixties; people of my age have more of problems of this kind than do younger readers. But even some 12 year olds may experiences such challenges. Beyond that, keep in mind that, according to a Kobo-sponsored study, older people are leaders in ereader adoption. Luckily I myself can use the Calibre ebook management program to add bold to public domain classics and other books without DRM, then email the results to the Oasis or other Amazon devices or apps. But what about people without the resources to add bold or other customizations that significantly enhance their enjoyment of books? Not to mention the commercial DRM titles, which readers can’t tweak without at least technically violating anti-circumvention language of the Digital Millennium Copyright Act. Amazon has failed us so badly that its own support people tell customers that the company will just wink if they bypass DRM even if this violates the DMCA. After all, the Amazon techies themselves privately engage in the same practices. The true solution would be for Washington to allow circumvention of DRM for noninfringing purposes, just as the Electronic Frontier Foundation and TeleRead writers and other booklovers have urged. But so far, the U.S. Copyright Office won’t listen. So if you don’t want to violate the DMCA, you’re stuck with the way Jeff Bezos and friends want you to read DRMed books. Why not more user choice? It’s almost as if Amazon is at war with users. In the past it has actually tweaked its operating system to discourage font hacking. On my $290 Oasis, I can call up just nine type styles, and even Helvetica, the darkest font, is a long way from being bold enough for me. That’s a fraction of the number of styles that my Nexus 6 phone can display when I’m reading with Moon+ Reader Pro. Even the Kobo offers just 12 basic styles. The difference is that whether through bold adjustments or others, you can sufficiently customize the typography for your reading needs. You can’t with Kindle software. And Moon won’t necessarily rescue you. Thanks to Amazon’s propriety DRM, Moon can’t read copy-protected Kindle books as “sold” (if, of course, the S word would apply to DRMed books in the first place). Furthermore, Amazon appears to be at war with users and in the past has actually tweaked its operating system to discourage font hacking. What’s more, even the software on the $290 Oasis won’t let customers vary the space between paragraphs or even choose between all justified text or ragged right—features that you can enjoy for free in the version of Moon+ Reader with ads. If you want to know everything you’re missing as a Kindle customer, compared to users of Moon+ Reader Pro and other popular Android apps for cell phones and tablets, check out Wikipedia’s comparison of Android ereading applications. TTS, a valid form of reading, as long as people pay attention to what they’re hearing, is missing from most Kindle E Ink devices. A Paperwhite add-on and a new $70 basic model do offer TTS, but the interface is for blind users only. Amazon’s recent E Inkers won’t even play audiobooks. Amazon may love to brag about its frictionless commerce, but when it comes to reading or listening, whatever you want to call it, the company has given us friction aplenty through its limited range of features and options. I’m not just talking about typography. Henry Ford supposedly said you could buy a Model T in any color as long as it was black, and similarly Amazon nowadays won’t sell you an ebook reader in any size other than 6 inches—this at a time when rival Kobo offers 6 and 6.8 inch readers and will soon sell the Aura One with a nearly 8 inch screen. If nothing else, the larger screen might make it easier for some readers to enjoy literary novels with longer paragraphs, especially older public domain works or William Faulkner’s Absalom, Absalom! (home to the world’s largest grammatically correct sentence, almost 1,300 words). Of course I’m grateful for the page turn buttons and the generally excellent ergonomics of the Oasis (where are those buttons on the Aura One, Kobo?) and other wonderful positives I’ve praised in my generally favorable Oasis review. I do appreciate Jeff Bezos’s talk of tearing down barriers between the reader and the actual words and sentences. But what good does all this do when the letters themselves are more of a struggle than they should be for me and too many others to see and absorb? Why haven’t Bezos and his Kindle crew learned from the television set makers and understood that expanding the range of choice is part of technological progress and will especially benefit upscale content? Guess who might be among the beneficiaries of Kindle hardware and apps friendlier to literary reading even her paragraphs are not Faulknerian in length? None other than Bezos’s wife, McKenzie Bezos, author of award-winning fiction. Of interest, too, is a $15-million gift that she and her husband made to Princeton University, their old school, to create the Bezos Center for Neural Dynamics within the Princeton Neuroscience Institute. Among other benefits, Jeff Bezos said the advances from the institute could promote “effective learning methods for young children,” and I’m all in favor of that—not just for children but for readers of all ages, and especially those who want to look beyond potboilers and both enjoy and learn from literary fiction. But even without further research, Amazon can do plenty in this regard simply by following the example of the television industry and expanding the range of reader choice. A good place to start would be the addition of an all-text bolding option or a still-better feature, a Kobo-style boldness adjustment, which Amazon could add to its firmware and apps for next to nothing in cost. The payoff wouldn’t just be in increased readability for those who needed it, but also in longer battery life, since bolded text requires less light to read it with. Yes, books of all kinds—literary, nonliterary, fiction, nonfiction—can be valuable in their own ways. But literary fiction has a special role to play if we consider its value in promoting empathy, not to mention its cultural value. Years have passed since an American—Toni Morrison, in this case—last won the Nobel Prize. Is the fault entirely the Nobel judges’? Can it be that the very best novels here in the U.S. just are not finding the right readers? Ebooks, optimally displayed for individual readers, could at least help change this. For now, however, books of all kinds, not just the literary variety, are in trouble in the United States. According to the Bureau of Labor statistics, a typical family spends only around $100 or so a year on texts of all kinds, including newspapers—compared to several thousand devoted to entertainment of all kinds. As noted, better technology by itself is not enough: the real issue is the decline in the U.S. of the book culture among the masses, a problem aggravated by short-sighted politicians, who in some cities have actually reduced the number of well-credentialed school librarians. So, yes, let’s care about the human part of the equation, the most important part. Just the same, while decent, customizable tech for the display of ebooks is a long way from a complete solution, it is a prerequisite if people are to live up to their maximum potential as readers in the digital era. Update: August 29: In comparing the Kobo Aura One and Kindles, I need to note that while the Aura display is advanced, Kobo’s software and ecosystem on the whole lag considerably. Unlike Kobo, for example, Amazon lets you mail yourself notes from the book you’re reading. But by offering decent typographical choices, Kobo makes the actual reading experience more pleasurable. I’m not sure “upscale” TV shows would be a good model for literary fiction. What little upscale TV I’ve seen with its episodic nature is better suited to genre fiction. House of Cards, for example, has a genre flavor more than a literary taste. Literary fiction may be a dying animal, or at least an increasingly marginalized one, and I think that’s sad, IMHO. It has a lot to offer. As I see it, authors who want to write literary fiction should distance themselves from TV as much as possible. Of course, I say this as a reader who doesn’t watch TV. I agree that Kindle would be improved with more advances in typographical options. @Greg: Thanks for your thoughts. House of Cards isn’t Shakespeare, but it demands far more of readers, er, viewers, than typical TV fare. As for authors of literary fiction distancing themselves from television, it depends on the kinds of novels they’re writing. In the past I’d have felt otherwise, but I don’t see how authors can write knowledgeably about contemporary life without knowing about mass culture. Granted, they need to be careful. References may end up too ephemeral. But all in all, if writers want to avoid navel gazing and want to write about all kinds of people, they would do well to watch as well as read. I hadn’t thought about cutural references in writing fiction – rather it was the imitation of style and pacing to closer match the TV experience that literary author need to avoid. Good fiction is its own creature and one of the worst insults, IMHO, is saying this book reads just like a it were a movie. In any case, I think authors of fiction don’t have to imbibe mass media to write about modern life – unless something is important to understanding a character or the plot. Saying a character is an avid fan of Breaking Bad is banal unless the author shows why that TV show is important to the character. How much the author would need to know about this or that TV show or cultural event would be in relation to its importance to the story. This brings back memories of a fiction writing teacher more than twenty years ago who said “Brand Name Reality” was an important device to show character; in essence, what brand product a character used was a way to create meaning. I never bought into it. If a character drinks Coke or Pepsi is meaningless unless there is something to back it up. As for Brand Name Reality, yes, I myself would worry about overuse of the names. But TV can help give a general feel for the mindsets associated with them.